The goal of the May 22-23 gathering was to formulate “Georgia’s Top 40,” key climate research questions that could eventually aid decision-making and planning for Georgia policymakers, scientists, communities and service organizations. An initiative of the Georgia Climate Project, the roadmap was a response to the fact that communities across Georgia are already exploring strategies to address the impact of climate change, says Daniel Rochberg, chief strategy officer for the Climate@Emory initiative and an instructor in the Rollins School of Public Health and Emory College of Arts and Sciences, where he focuses on climate change and sustainable development. 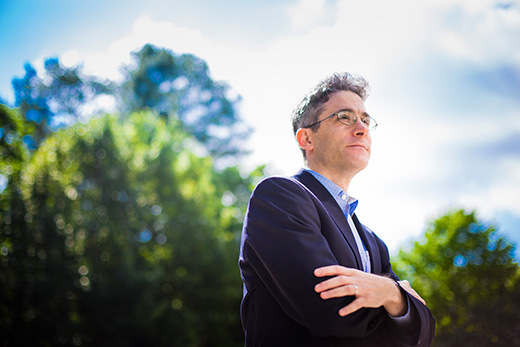 Some Georgia communities are actively assessing vulnerabilities and strategies to build resilience to potential climate change impact, while others are developing technologies and policies to begin reducing emissions, according to Rochberg, who has also worked for the U.S. State Department as special assistant to the lead U.S. climate negotiators under presidents Bush and Obama. “To inform this work, decision-makers at all levels need credible and relevant information from across the natural, applied and social sciences,” says Murray Rudd, an associate professor in Emory’s Department of Environmental Sciences and member of the climate research roadmap steering committee. “The Georgia Climate Research Roadmap seeks to fulfill this need by identifying the key research questions that, if answered, can lay the groundwork for the state and its residents to take effective, science-based climate action,” he says. Co-founded by Emory, the University of Georgia and the Georgia Institute of Technology, the Georgia Climate Project is a multi-year effort by a statewide consortium of universities and colleges, working with partners to improve understanding of climate impacts and solutions in Georgia. As a starting point, the roadmap project solicited potential research questions from government, industry, non-governmental and academic experts through an internet-based form. Potential research questions covered a vast spectrum, from the impact of climate change on agriculture, natural resources and the state economy to human populations, public health, community infrastructure, energy and transportation. During the workshop, more than 40 experts from a range of sectors, fields and organizations from across the state — including public and private universities, city, state and federal and governmental offices, environmental groups and industry — winnowed an initial pool of about 180 questions down to the final 40. Through breakout groups, probing questions and robust debate, participants brought a variety of professional perspectives to the challenge. For researchers and scientists, the top-40 list could also “help to guide our work and grant-writing, encouraging people to think about these questions and incentivize more of them to work on these issues,” Rochberg says. “The idea is there are tons of experts around the state working on this issue and we can and should do a better job of pulling them together, working to advance our understanding of climate change and putting forward ideas of how to respond to the challenges it presents,” he says. After further refinement, “Georgia’s Top-40” will be submitted to a peer-reviewed research journal and shared with the public and policymakers this fall. Later this year, participants will also circulate a survey and conduct interviews to rank the questions in order of priority. The ranking will be done to understand how priorities differ between various sectors, disciplines and regions, says Rudd. Distribution to a diverse audience should help pinpoint any issues that may have been overlooked, he notes. Plans also call for the final list to be posted on a searchable, web-based interface, which may eventually become “a clearinghouse for information,” Rochberg says. Despite long hours of discussion in defining the final list, participants expressed praise and enthusiasm for the process. “Many people feel climate change is the biggest challenge of our times, so to be in a room with so many experts and thinking about the many ways in which this issue will touch the state of Georgia and so many facets of our lives has been amazing,” says Althea Moore, a marine ecologist and post-doctoral fellow at Emory working on the Climate Research Roadmap. “Going forward, identifying research priorities will help us know where to put our resources as a state,” she adds. Shubhayu Saha, a health scientist with the Climate and Health Program at the Centers for Disease Control and Prevention (CDC), says the interdisciplinary nature of the exercise is especially important. “This is such a cross-cutting issue,” says Saha. “Having these discussions only within your own disciplinary silos never allows you to get a full sense of the complexity of an issue, the different stakeholders who need to be involved.